Origin: Across entire Mediterranean region from Portugal across north Africa into Syria, Turkey and Iran on dry rocky slopes above 3,000 feet. Landscape Use: Great landscape filler for xeric landscapes, rock gardens, containers. Form & Character: Stiff, tough, rounded, symmetrical evergreen landscape perennial sometimes treated as a summer annual in colder climates. Growth Habit: Stiffly upright and spreading subshrub herbaceous forb to 2 feet in height with a 3 to 5 feet spread. Foliage/Texture: Fleshy, almost succulent gray green lanceolate leaves to 1 to 2 inches long, tapering to tip, nearly sessile, stems nearly succulent and exude a low grade white rubber latex; medium texture. Flowers & Fruits: Yellow flowers aging to orange are encased in dominant fused yellow sepals clustered at branch terminals, sepals turn green and then light brown as they age and senesce; fruits are green and multi-carpulate. Temperature: Heat loving. Cold tolerant to 10 to 20oF. Light: Full sun will promote a tight and rounded canopy. Partial shade will cause stems to elongate. 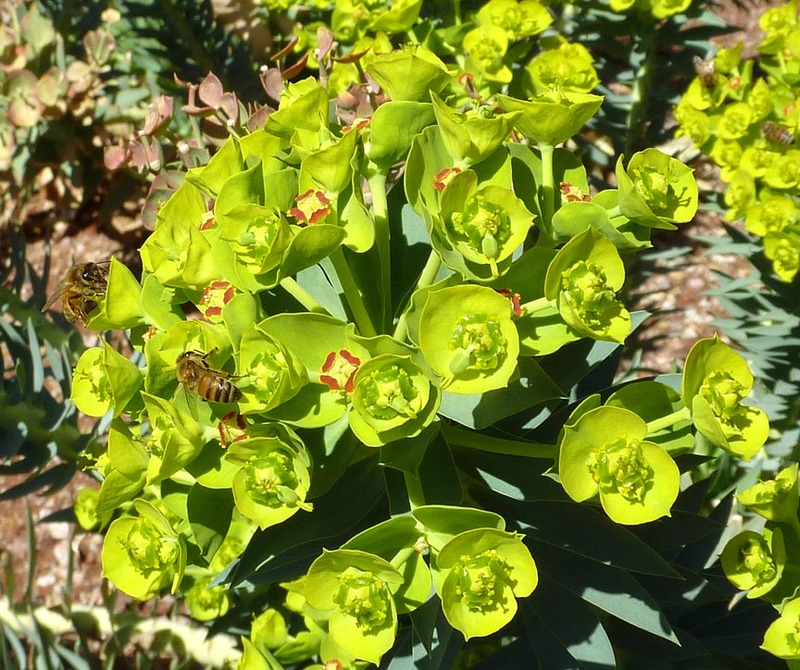 In Phoenix, silver spurge does poorly in full shade. Soil: Tolerant of soil alkalinity and thrives best in well drained soil; mildly salt sensitive showing as apical tip necrosis on older leaves. Watering: Infrequently regular irrigations are necessary during summer, but no supplemental water is needed during winter. Pruning: Can and should be cut back severely during early fall to rejuvenate growth. 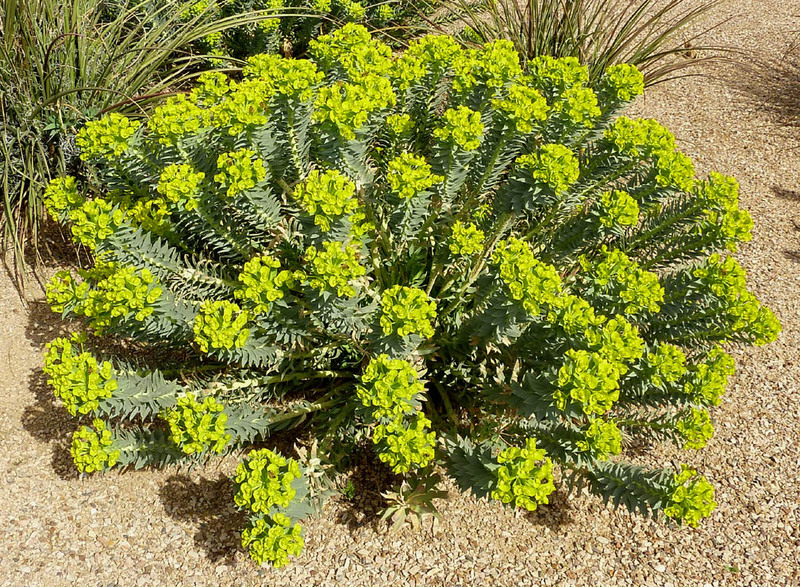 Additional comments: Silver spurge is a reliable low growing perennial subshrub for Phoenix xeric landscapes. The latex sap is poisonous causing a mild skin dermatitis upon contact. Euphorbia is a diverse genus containing the popular pot plant, poinsettia. There are at least 96 recognized species many of which make fine landscape shrubs and sub shrubs. Flowers strongly attract bees.